If you’ve reached a certain ‘quality vintage,’ you may recall one of early TV’s Howdy Doody show’s characters: Princess Summerfall Winterspring. Her name spans the calendar seasons, as does the current 12-book BioFables series. The first BioFables book takes place in Spring (April) and the first series finishes twelve months later, in March, of whatever (relatively-contemporary) year you choose. 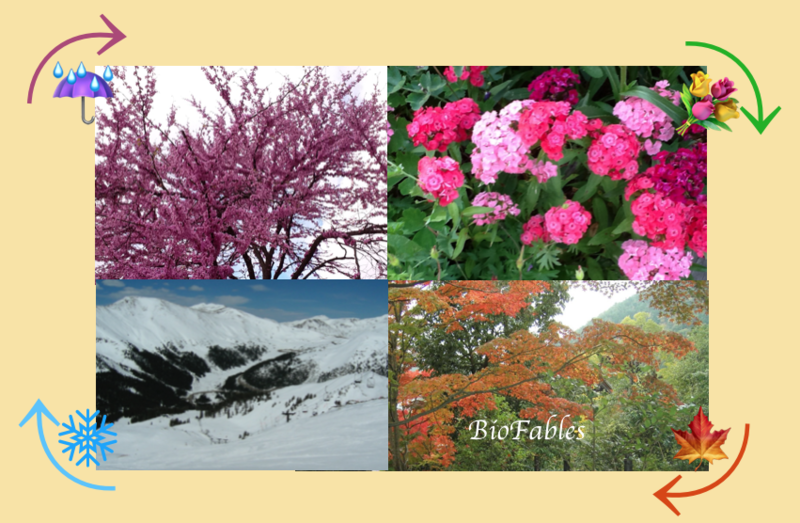 The actual year isn’t important, because BioFables books focus on outdoor activities and pop-up lessons in nature-based science and other areas. Celebrating the changing seasons is timeless. You can enjoy reading the Spring and Summer books (see links); patience, please, as the Fall and Winter books are being prepared. New life springs (sorry, bad pun) from winter’s dormancy. So, too, BioFables’ first story, Whoosh! begins in April. It’s a time of discovery; seven-year-old Melody Maloney discovers that she’s something of an extremophile. In May, her twin brother, Mallory, discovers that he’s something of an extremophile as well in E-I-E-I-Uh Oh. June finds the family at the Indiana Dunes. Mallory, his father and his dog head down Mount Baldy, while his Mom and sister continue the climb to the top of the dune. Sand Sack reveals a surprise waiting in the dune’s shifting sands. The longer days and warm weather offer extra time for enjoying outdoor activities. Seeds planted in the spring are transforming into the vegetables and flowers that nourish our bodies and our senses. July finds the Maloney family taking in the Mississippi River from atop the Palisades and up close and personal on the Iowa side of the mighty river. Death’s Door and more await in August’s exploration of the islands a Stone’s Throw off the Door County peninsula. Fishy stories and fascinating effects of gravity await in September’s Catch of the Day. Autumn leaves change from green to brilliant shades of reds and golds. The Maloney family will discover a joyful change as well in October’s Pumpkin story, a change that becomes permanent in November’s Thanksgiving story. While no longer technically a part of the Fall season, December’s Christmas in the Rockies introduces members of the Maloney family’s extended family. The temperatures may drop, but the Maloney family is hardly dormant. An ice rescue makes one of the family a hero in January’s Starved Rock in Winter. February’s Mammoth Cave reveals the adaptability of fish and other wonders beneath the earth. Ninja Mom does her best in Yokohama, Japan, in March.